Kandy, Sri Lanka is about a 3-hour drive from Colombo. It’s the second largest city in Sri Lanka. Surrounded by beautiful tea plantations and mountains, temperatures in Kandy are between 19 – 28C all year around. Loads of young people hang around the park and we enjoyed visiting this place more than we thought we would. Many famous people such as Queen Mary or Gandhi have planted trees in the Memorial Garden. The entry fee is 1100 rupees. 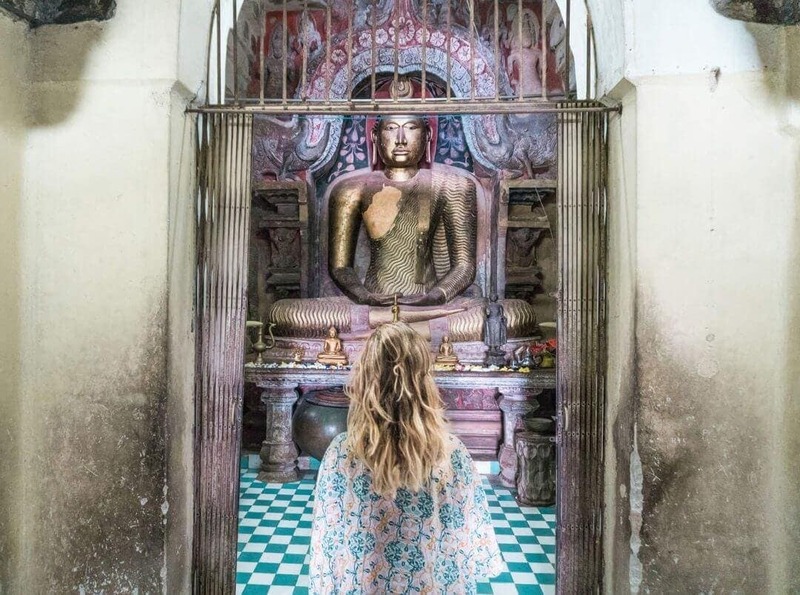 The Temple of the Tooth, also known as Sri Dalada Maligawa, is a beautiful Buddhist Temple in Kandy. Monks daily visit the temple and many rituals take place throughout the day. You can see the tooth box behind a glass window. It’s usually really busy, so we recommend going early in the morning. Watch out for all the local guides who want your money at the front. 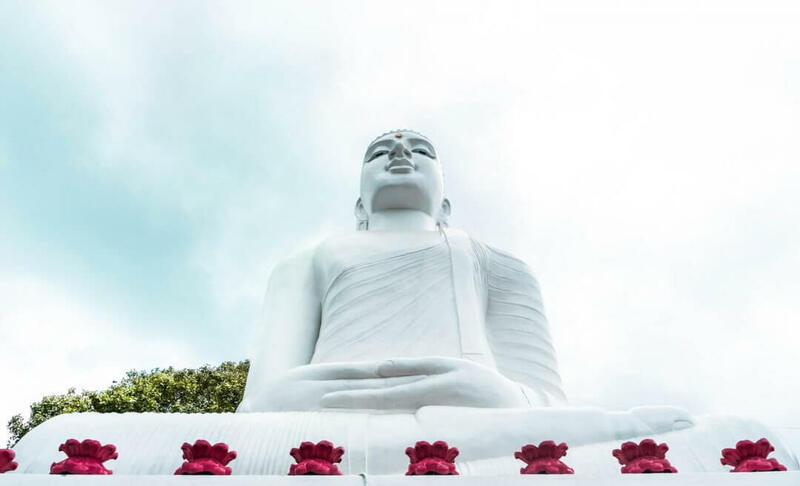 This not only one of the biggest Buddha statues of Sri Lanka but also an incredible view point. If you climb up the stairs on the back of the statue you’ll have an even better panoramic view of the city. A Buddhist temple just outside the center of Kandy with a fine structure made of stone and a calm atmosphere stands on a hilltop offering you an amazing view. Gadaladeniya temple is a great place to escape the crowded attractions in Kandy. Tip: Make sure you’ll have a small amount of money with you for donations. Also, keep in mind that you will have to cover your knees and shoulders. Kandy Lake is the most iconic place in the entire city. It’s located in the heart of Kandy, next to the Temple of the Tooth. The scenery is pretty, and there are several peaceful spots where you can just sit and stare at the river & the Temple. There’s even an island in the lake, with palm trees! Take the train through the green tea plantations to Nuwara Eliya or Ella. A ticket to Nuwara Eliya will cost you around $2,50 / 400 LKR. The ride to Nuwara Eliya takes 4 hours and 7 hours to Ella. The train ride has been mentioned as one of the most beautiful train routes in the world! And we totally agree on that! 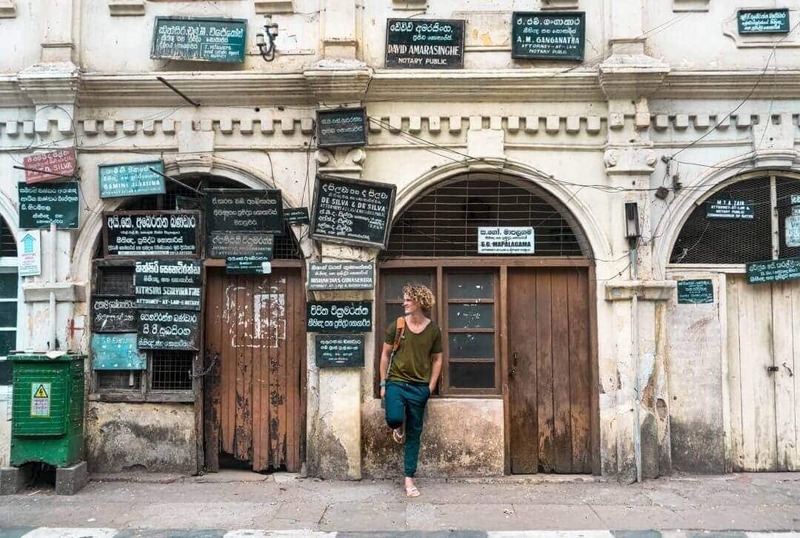 Where to stay in Kandy, Sri Lanka? We got you a $15 discount at Booking.com if you book via this link. Find all the hotels in Kandy under $50 a night. It's a hostel and double room hotel. A great view out of your bed. Starting at $9. One of the top rated hostels in Kandy starting at $9 a night. Great double rooms starting at $20 a night in low season. On a perfect location with a nice garden. Starting at $24 a night.